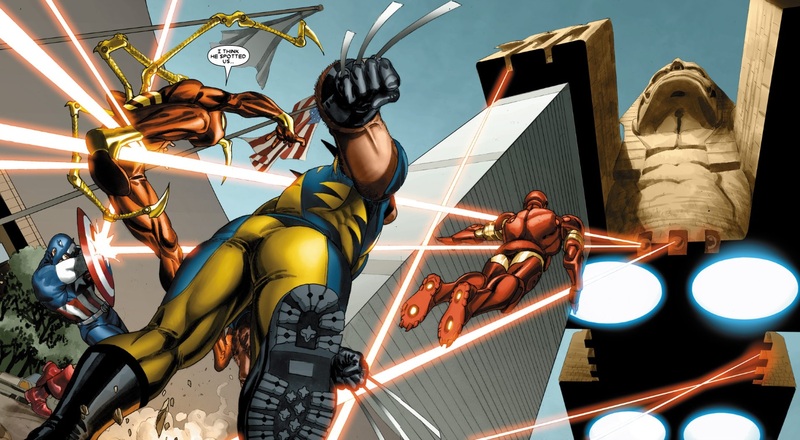 Though Salvador’s Larroca’s art style immediately turned me off “The Day After” storyline in Decimation, I wanted to soldier on through the X-Men series as it comes to an end with the epic X-Men: Messiah Complex in another twenty issues. I was looking forward to “Blood of Apocalypse” as not only is the infamous villain an absolute classic but I also really enjoyed the two-issue preview build-up that was served in issues 26-27 of Cable & Deadpool (Final Thoughts coming soon). Unfortunately the return of one of the X-Men’s most powerful villains is completely and utterly lame. 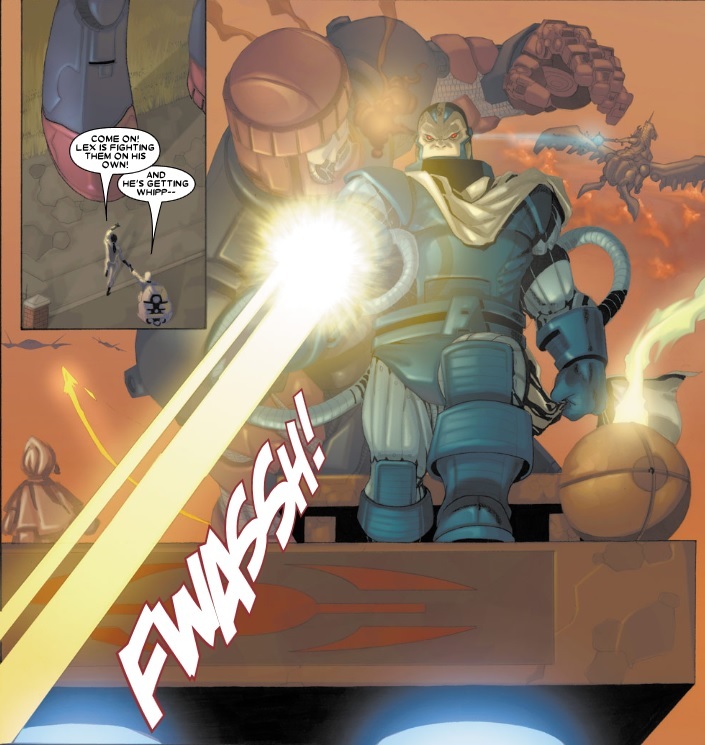 Apocalypse shows up in a giant sphinx that acts as both a ship and base of operations and lands right outside Xavier’s mansion. Naturally the X-Men begin freaking out and attack it, and Apocalypse unleashes his first of four horseman – Famine, formerly the crippled Sunfire. I was immediately rolling my eyes at the notion that, despite a new tactic of wanting to save mutantkind from the brink of extinction (by killing most humans), he simply regurgitates past encounters and unleashes new thematic horsemen as minor villains for our heroes to defeat. 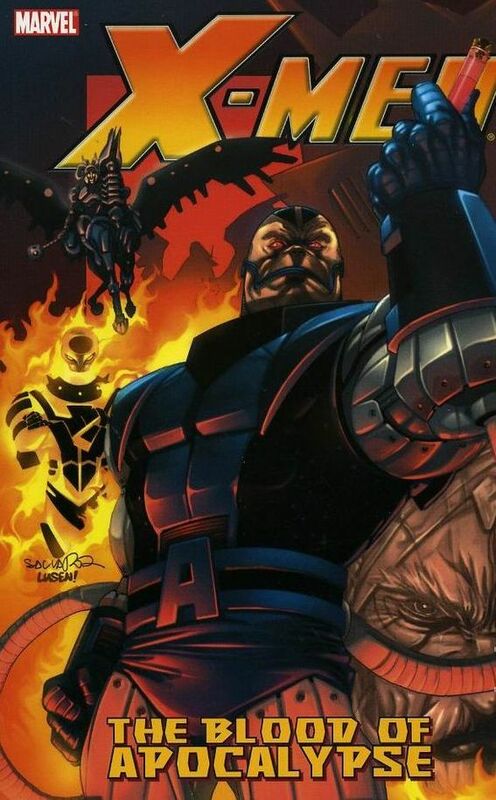 Famine is defeated (and somehow reverts back to Sunfire, though he keeps his powers and legs, convenient) and Apocalypse makes a show of force by destroying all the sentinels of the O*N*E that have been assigned to peacekeeping duties at the mansion since the events of House of M. I did appreciate that events are closely tied to the continuity and current events of the X-Men at the time, though it still doesn’t amount to much. With the sentinels destroyed many of the refugee mutants side with Apocalypse, though that also doesn’t amount to much. Apocalypse’s sniveling sidekick Ozymandias (wait, since when does Apocalypse need a sniveling henchman) betrays his master and leads the X-Men into the sphinx where they can launch an attack. Battles ensue and our heroes discover that Gambit had gone willingly to Apocalypse to be transformed into the horseman Death (I hadn’t read any X-Men before Decimation, so I was unaware of Gambit’s woes with the team). The X-Men manage to destroy much of Apocalypse’s blood, which acts as a cure to the plague he plans to unleash via Pestilence (a transformed Polaris). After they retreat, Apocalypse crashes into the United Nations and gives a pithy Bond villain-esque declaration on how humanity needs to cull themselves lest he do it for them. Since when does Apocalypse deign to make demands and threats? If you can’t tell, I abhorred his characterization and motivations throughout the story. Apocalypse is finally defeated when some new heroes join the fray (namely Iron Man and Captain America) as well as a pair of fancy new sentinels that reminded me of the jaegars from Pacific Rim. The sphinx ends up in the East River and Apocalypse ends up escaping via some sort of space portal. Polaris is rescued, though Sunfire takes off with Gambit-Death, and the epilogue issue attempts to make us care about their plight, as well as the tiresome Yes, Our Villain Will Return ending. The art is actually much better than “The Day After,” less manga-ish but still much too cartoony for my tastes. The worst part of “Blood of Apocalypse” is definitely the story, and lame story plus art I don’t like equals a pretty terrible experience. Even the side plots are lame, with awful love triangles involving Polaris-Iceman-Havok and Rogue-Gambit-Pulse that reek of Young Adult novel clichés. I can’t recommend “Blood of Apocalypse” at all, but thankfully it looks like it was Larroca’s last stint on X-Men. I’ll still try to read all the storylines between now and Messiah Complex, but I’m much more looking forward to the stories in Uncanny X-Men and X-Factor (two series that I’ve found far more superior thus far).